Of What, To What, and For Whom? Resilience, Transformation, and Livelihoods in West Africa. 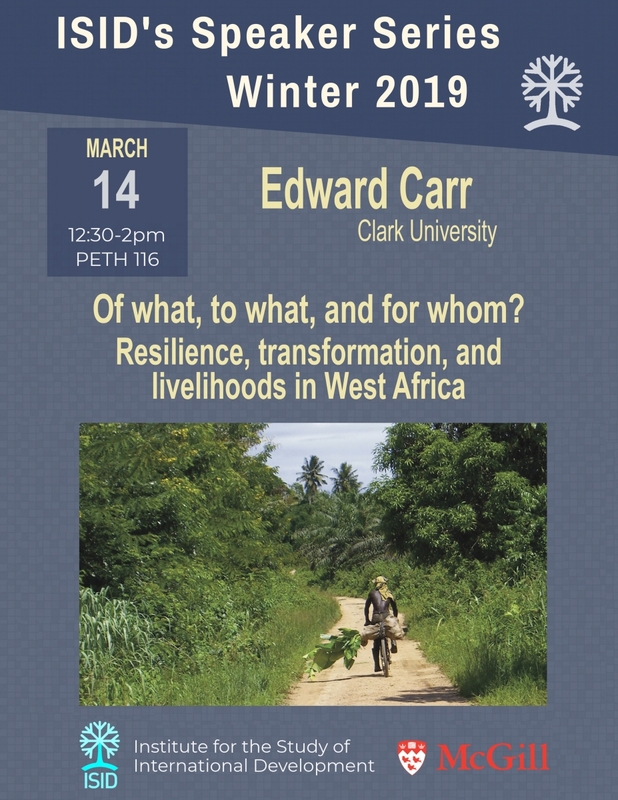 A guest lecture by Edward R. Carr, Professor and Director, International Development, Community, and Environment Department and Director, Humanitarian Response and Development Lab, Clark University. Development’s recent “resilience turn” has shifted emphasis and attention to projects and programs that build individual, community, and national capacity to address the shocks and stressors endemic to a world of environmental, economic, and political change. A focus on livelihoods is often part of such programming. While productive in their inherently integrative approaches to understanding vulnerability and potential means of addressing it, such programs often frame resilience as an unproblematic good, failing to fully interrogate that most basic of questions: resilience of what, to what? The livelihoods that are often “made resilient” through such programs are not merely means of making a living, but ways of living in the world, projects of rule that define and maintain shared framings of appropriate roles, responsibilities, and actions. When we make livelihoods resilient, we also make the particular configurations of power in that project of rule resilient, promoting the needs and interests of some over those of others. In short, resilience programming has to wrestle with the fact that a resilient socio-ecological system is one that manages not only specific material challenges, but also any challenges to the social order that grants those in authority their privileges. At the same time, resilience, as a project of rule, is not totalizing – it is a project in need of constant maintenance, contested by shocks and stressors without and the agency of actors within. By identifying those agents and their pathways to change in systems whose resilience also provides material safety and certainty, we can better understand how resilience and transformation might coexist.